Fabio Capello has included a quartet of Manchester United’s bright young things in his provisional England squad for next month’s Euro 2012 qualifying ties against Bulgaria and Wales, with Phil Jones expected to graduate into the squad proper for the first time. Jones, a £16m signing from Blackburn Rovers earlier this summer, is joined by Danny Welbeck, Tom Cleverley and Chris Smalling in being informed they are in the provisional party. Jones and Welbeck have also been included in Stuart Pearce’s initial 27-man squad for the Under-21s’ qualifiers against Azerbaijan and Israel but, while Capello is keen not to weaken the junior side, it is likely that both will now step up into the senior group to be announced on Sunday evening. The England manager was at Old Trafford on Monday to witness United’s young side eventually dismantle and overpower Tottenham Hotspur. Welbeck, who was included in the squad for this month’s cancelled friendly against Holland having made his debut against Ghana in March, scored United’s opening goal and set up another with a back-heel in their 3-0 victory. Where he would have benefited in the absence of the injured Darren Bent against the Dutch, Welbeck’s form at United could now justify his inclusion as one of the expected four forwards in the final 23. 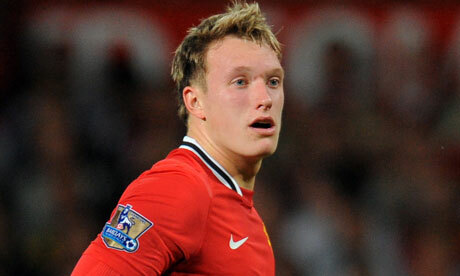 Yet it was Jones’s commanding display at the back against Tottenham that truly impressed Capello. The 19-year-old, who has been involved in provisional squads in the past but never the final group, has been pinpointed as a potential key performer with the full side this season in the build-up to next summer’s finals in Ukraine and Poland, with his elevation to the senior party anticipated particularly given Rio Ferdinand’s injury problems this term. The England vice-captain, who damaged a hamstring at West Bromwich Albion on the opening weekend of the Premier League season, is back in training at Carrington but would need to feature against Arsenal at Old Trafford on Sunday to prove his fitness ahead of the game in Sofia. Should Ferdinand not start that game against the London side, then Capello is unlikely to select the centre-half for the upcoming Group G fixtures, as the national coach is keen to pick players who have demonstrated form and fitness during the early stages of the season. The absence of Glen Johnson at right-back with a hamstring injury could allow Smalling, a revelation in the position with United having previously been considered only a centre-back, a route back into the seniors. The Tottenham Hotspur full-back Kyle Walker is also in the provisional squad, along with Micah Richards of Manchester City. Jack Wilshere’s absence with an ankle injury should now allow Tom Cleverley – who was called up as a late replacement ahead of the scheduled Holland fixture in the absence of Frank Lampard and Michael Carrick – a second chance to earn a first cap.